This depression test is designed to help you learn what causes depression (where it starts), the symptoms of depression (the results), and how to heal. You or someone you love is depressed, and that's why you're here. Learn to use your brilliant mind to understand and heal your depression. You will feel hopeful after learning about the signs of depression in this test, followed by practical steps you can begin taking right now to feel better. Tell your story or ask your question about depression and get some help. It has been shown in research studies that simply writing about your feelings can help you tremendously! I am not a medical doctor. I am a Licensed Professional Counselor, with a Masters Degree in Clinical Psychology and a Ph.D. in Counselor Education. I have over 40 years of experience in helping people deal with causes and symptoms of depression and other related problems. I designed this depression test on the basis of my professional training and experience. I do not subscribe to the "chemical imbalance" theory about depression. My research, education and experience has taught me that our brain chemistry changes in response to a wide variety of fluctuating factors, such as diet, age, abuse history, mood, and current environmental stressors. The "chemical imbalance" theory about depression assumes a permanent condition from birth to death, and I am aware of no research that actually proves that such a phenomenon exists. I have worked with thousands of clients who were taking or had taken antidepressant medication. These medications treat the symptoms of depression (such as those you saw in the above depression test). Antidepressants do not get to what actually causes depression. I believe that some people are definitely more inclined toward depression than others. To me, that does not say that they cannot heal, or that they will need medication for the rest of their lives. In my work as a counselor and on this site, I help people heal what causes depression. Preview the Audio CD program below, where you will hear me talking about this important topic. Unexpressed sorrow, fear and anger. When these strong emotions are allowed to build up over time without expression or release, depression is bound to occur. From this perspective, depression can be seen as "impacted" negative emotion. 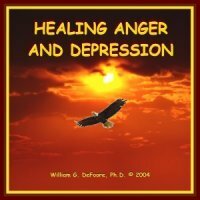 On this site, you will learn about healing anger and depression and many other different forms of healthy ways to express these emotions. Unresolved abuse, abandonment and neglect issues. These traumatic memories, when unaddressed, become like "black holes" that drain your energy, and can certainly lead to many of the symptoms of depression we covered in the depression test. You can get some help with this now, with counseling, or by reading our books. Continued disappointment. When dreams are unfulfilled, plans fail, and hopes are thwarted, many people go into despair and become depressed. This is a kind of "giving up" on yourself. I encourage you to never, ever, ever give up on yourself! One of the best things you can do for yourself here is to heal emotionally through inner child work. Ongoing marriage conflict or difficulty. Your marriage is one of the most powerful emotional influences on your life, and when you have tried everything and nothing gets better, it is all too easy to get depressed. Learn about dealing with anger and disappointment in marriage and how to create sacred roles in marriage. Serious health problems. One of the most common things that causes depression is prolonged illness or injuries with long recovery periods. The thing to be aware of here if that depression can make the illness worse, because depression depletes immune function and slows down the healing process. Sometimes, healthy anger can be the key to breaking out of this cycle. Negative, self-limiting beliefs. This is one of the signs of depression, but it can also be part of what causes depression. If this applies to you, start today to become more positive in your thoughts! Watching too much depressing news. If you find yourself stuck in this, then subscribe to Dr. DeFoore's Goodfinding newsletter, and start learning about all of the good things happening in the world right now! Not getting any exercise. Did you know that physical exercise is one of the best treatments for depression there is? It's true, but nobody can make a lot of money off of that fact, so it's just not advertised. But now you know it, so get moving! Spending too much time indoors. We need time outdoors, no matter what the weather. I hope you got some help from this depression test. Remember the saying, "Everyone needs someone to love, something to do, and something to look forward to"? This is so true. Make sure you have all three of those in place, and that will do wonders for healing and preventing depression. Take another excellent depression test at DepressedTest.com, or learn more about depression types and symptoms.